A ladies purse in nappa leather with a triangular design on the front. The closed size of the purse is 13 x 10 cm. At the back is a slot for papers. It opens up in the form of a tri-fold. On the extreme left is a press button coin purse as well as a bellow pocket. 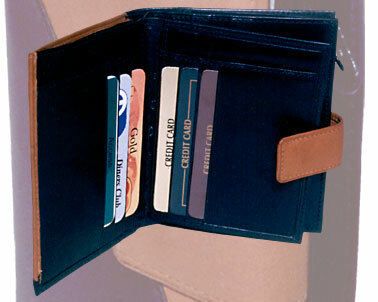 There are four credit card slots, net window for a driving license and zip pocket in the middle. 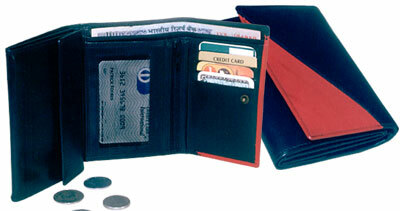 There are two compartments for currency notes of size 19 x 13 cm. It is also available in a variety of leathers and the standard range of colours. A zip closed leather ladies purse with a metallic runner. 23.5 x 12.75 cm. It has two compartments for currency notes and a press button pocket for coins and loose change. 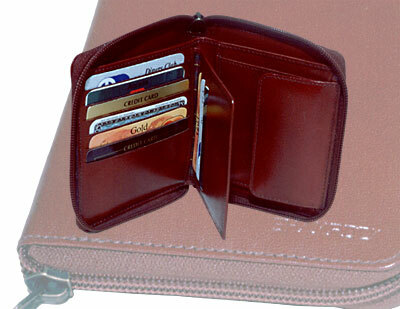 There are two side pockets and a detachable section for six credit cards. Along with that there are six credit card slots. The detachable section is ideal when you would like to go out but do not want to carry the purse. A beautifully crafted ladies purse with a triangular leather colour combination. The model has a zip pocket in the back for coins. It is shut by the tab and dome system with the loop matching the colour of the triangular shape. There are two button holes to take care of expansion. The closed size is 10 x 12 cm. On opening there are two compartments for currency notes. The RHS has four pockets for cards and the LHS has a net window for the driving license. Beneath the net pocket is another section for six credit card slots and two pockets of size 10.5 x 8.5 cm. The model can be made in different types of leathers like Cow Polished, Cow Nappa, Cow Vegetable, Buff Resin, Buff Glazed, Buff Vegetable and Cow Softy. The colours available are black, blue, brown and shades of cognac and burgundy.